A pot in the midst of the naked raku process. Naked raku gets its racy name because during the process of firing, the outer shell of slip that was applied falls off revealing the “naked” surface of the pot underneath. Charlie and Linda Riggs have been doing the naked raku technique, also referred to as slip resist raku, for years. Today, Charlie and Linda share their take on the naked raku technique. – Jennifer Poellot Harnetty, editor. We use a method of naked raku that employs a very thick slip that is applied to the surface of a pot. When it dries, it shrinks and crackles like mud does on the side of a road. The vessel is fired to 1450°F, then carefully removed from the kiln and placed into a metal can lined with newspaper. Then the can is sealed with a tight-fitting lid. This infuses the pot with smoke. The thick slip resists the smoke so that the pot surface remains white underneath it. The crackles in the slip allow the smoke to reach the surface of the pot. When the pot is finished and the slip is removed, you have a pot with a beautiful black crackle surface. This technique requires persistence and patience. 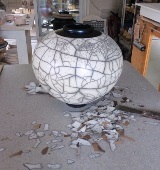 It takes practice to remove the pot from the kiln without knocking off the slip. The slip itself requires slight adjustments to the amount of alumina. It is also important to use the right type of fire clay in your slip. To find a slip that works for us, we bought samples of all of the types of fire clay we could find that were easily available across the country. We found one that worked very well, Hawthorne, but then later, through serendipity, made a batch with Lincoln fire clay and it stayed on the pot even more reliably during the raku process. The final recipe we arrived at is measured by volume: 5 parts Lincoln fire clay, 3 parts EPK kaolin, and 2 parts alumina hydrate. Mix this up with water into a thick slip. Mix the dry ingredients with water until you get a consistency of thick cake batter (figure 1). Add more alumina hydrate if the slip doesn’t stick well to the pot during the raku process and subtract it from the recipe if the slip is difficult to remove from the surface after firing. Mask off the areas you want to remain black using house painter’s tape (figure 2). This tape is less sticky than regular masking tape and is less likely to harm the surface of your pot. To get a pot with uniform crackles, lower it down into the slip and remove it all in one uniform movement (figure 3). Carefully remove the tape, taking care not to get any slip on the areas that you want to remain black (figure 4). This slip is very sticky at this stage and is difficult to wipe off without leaving residual clay marks on the pot. Immediately put the pot into your raku kiln (figure 5). This means within first 2–5 minutes after applying the slip. Don’t allow any drying at all. Fire the kiln quickly to 400–500°F and soak at that temperature until the slips loses all its moisture and begins to crackle (about 15 minutes). It will turn a dull gray and no longer have a shine on the surface. Then fire the pot up to 1450°F. While the pot is in the kiln, line a steel can that is slightly larger than the pot with a several sheets of newspaper (figure 6). This size of container lessens the air space during the smoking process, which will force more carbon/smoke into the slip crackles on the pot. At 1450°F (figure 7), use raku tongs to quickly and carefully remove the pot and place it in the metal can reduction chamber that’s been prepared for it. Place some newspaper on top of the pot before closing the can. This enhances the blackening of the piece from the top down. Allow it to cool in the can for about 10 minutes. Open the lid, allow the smoke to clear, and look in. The slip will be black (figure 8). Wearing raku/welders gloves, lift the pot out. Note: The piece may still be very hot, so use caution when handling it, even when wearing gloves. Place it on a kiln shelf, fire brick, or other non-flammable surface to cool. The slip will either fall off as you remove it from the can or you will need to wait until it cools so you can gently remove the slip using your fingers (figure 9). Remove excess slip and dust from the pot with a plastic scraper, or an old credit card (figure 10). Rub the rest of the dust off with a terry cloth towel. The cleaned pot is ready to seal with wax or an acrylic sealant. Add:, alumina, alumina hydrate, brick, carbon, chamber, clay, clear, consistency, crackle, dry, epk, epk kaolin, excess, fire clay, firing, ingredients, kaolin, kiln, marks, naked raku, open, pot, process, raku, raku kiln, raku process, raku technique, raku tongs, recipe, reduction, residual clay, resist, share, size, slip, slip resist, slip resist raku, surface, technique, the raku, tongs, vessel, water, wax. Does anyone know what thickness is needed for the big crackle verses small? I have been using this technique for about 2 months now with beautiful results but always get the small crackle. Should I apply the slip thicker for the large areas to appear, or is that achieved with a thinner coating of the slip? Anyone have any experience doing this process w/ a dark stoneware? I’m getting beautiful results except for some white specking residue that’s really hard to scrub off. Wondering if that residue is on the white pieces I’m seeing but not so visible? Wondering about formulas w/ a darker fireclay..? Never seen a fireclay dark enough to make a difference in this situation. Coloring this slip w/ iron? Would be best to get rid of the specks all together but no such luck so far. Beautiful result.Thank you for sharing. Great technique. Charlie and Linda are the best at this. The one step is quite a challenge. TO keep the slip on long enough to get the pot from the kiln to the reduction bin is quite a treat. I have been to a couple of workshops they have presented in my area. they share their knowledge base with ease and without restrictions. Make some pieces with broad shoulders (this shape seems to present the best crackles in the slip) and get to work.